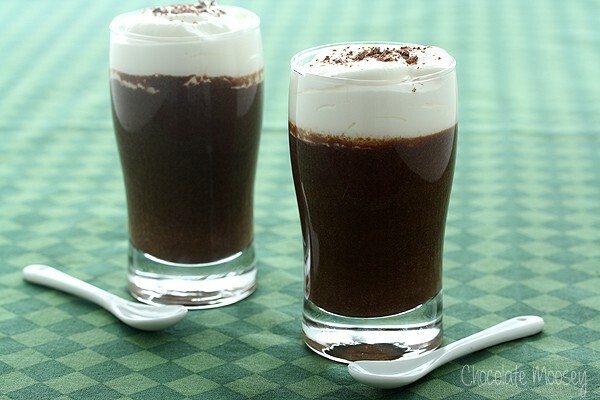 Chocolate Guinness Mousse Cups For Two are a fun yet decadent dessert for adults. If there’s one thing that makes stout beer even better, it’s chocolate. As I’m sitting here thinking about my favorite flavor combinations, there seems to be a common theme. Chocolate and peanut butter, chocolate and mint, chocolate and caramel, chocolate and Guinness. Chocolate really does make the world a better place. Even if you don’t like drinking Guinness, I bet these Chocolate Guinness Mousse Cups will change your mind. Sinful, luscious, decadent. That’s what went through my mind the first time I licked the spoon. Guinness and chocolate just play so well together. In fact, I ate both mousse cups because I loved it that much. Oops. Don’t tell my coworkers. They’ll get mad I didn’t share. The first time I had a Guinness was in Ireland after the first day of orientation. I studied abroad at the University of Limerick and met tons of other study abroad students. As we got to know each other during orientation, we moved our socializing afterwards to the pub on campus. A group of us wanted to experience a real Irish beer in an Irish pub, so we split a Guinness. I do regret not visiting the Guinness factory in Dublin, but that’ll happen next trip back. For presentation, I used two mini pint glasses, which makes them more fun to eat for St. Patrick’s Day. Of course since they are a novelty item, feel free to split between two plain small glasses, two bowls, two coffee mugs, or even two ramekins. If you do put it all into one big glass, it now becomes a single serving dessert. Or so I tell myself. If you do use the pint glasses, I used a piping bag with a round tip to neatly add the whipped cream. I can’t take all the credit though. 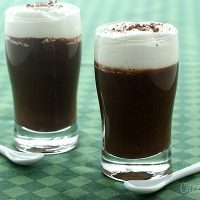 As I was browsing one of my cookbooks, I saw a recipe for chocolate mousse topped with whipped cream in shot glasses, just like mini beers. Why not take it one step further and put Guinness in it, making them just like mini Guinnesses? I was torn between making a mousse or pudding, but because I didn’t want egg whites leftover, I opted for mousse. In a large saucepan, heat the Guinness and 1/4 cup cream until bubbles start the form. Remove from the heat and whisk in the chocolate until melted. In a small bowl, whisk together 1 tablespoon sugar and egg yolks. Whisk in a little bit of the chocolate mixture then pour back into the saucepan. Cool 15 minutes. In a medium bowl, beat the egg whites until stiff peaks form (when you pull the beaters straight up, the peaks will not fall over). Fold the whites into the chocolate. Pour the mixture into two mini pint glasses. * Chill for at least 1 hour or until set. In a large bowl, beat the remaining 1/2 cup cream until it thickens. Gradually beat in the remaining 1 teaspoon sugar. Beat until stiff peaks form. 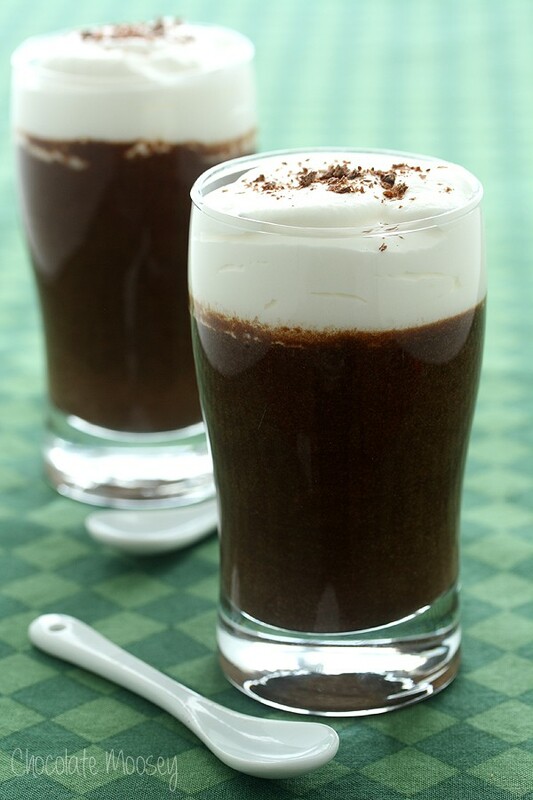 Pipe whipped cream on top of mousse and garnish with grated chocolate. 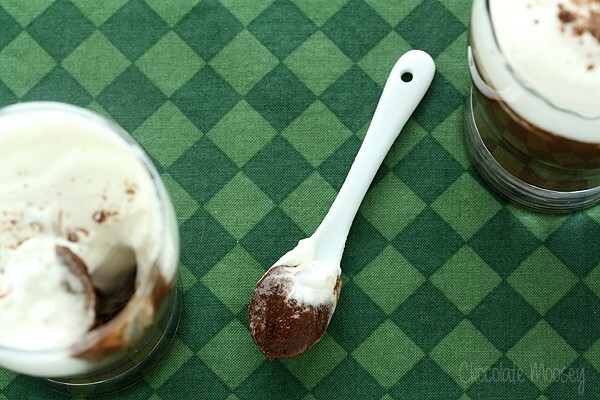 *If you don't have two mini pint glasses, you can use plain glasses, ramekins, or bowls. I love that you made them look just like a pint of Guinness! I agree; the chocolate/Guinness combo is a winner….these look great! I knew I had to! I don’t think you could get any better than mini Guinnesses. Carla these are ADORABLE! My spouse is not such a fan of dessert (I know, all the more for the rest of us) so I’d have to eat his as well. Adorable! Guinness + chocolate that looks like guinness is a win! I love love love the styling of these photos, Carla. 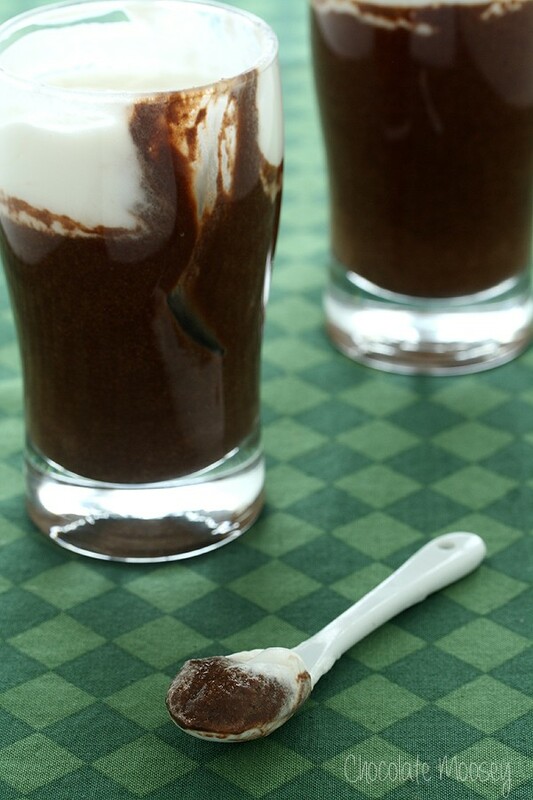 It was such a good idea to have the mousse look like frothy Guinness beer in those pint glasses. I drank so much beer in university. It was awesome. You’re making me want to run out and buy some Guinness now so that I can make this! Good thing I work across the street from a liquor store. 1. Chocolate makes everything better. This is truth. 3. These are SO cute–how you made them almost look like mugs of Guinness! so clever and tasty! I adore Guinness. I especially adore Guinness paired with chocolate. These look wonderful. Ha! They look like actual glasses of guinness. Perfect. Yes I’m tickled with the way they turned out! Would any brand of beer do? I live in a Muslim country so our options are pretty limited. All we get is 3 Horses, Heineken, Barbican and Carlsberg. In this case, I’d highly recommend sticking with a stout or similar dark beer since it’s paired with chocolate. I looked at your choices and feel they are too light of a beer. You can, however, substitute coffee for the beer. It’d obviously be a different recipe, but you can still make the recipe as written with coffee. Eggs are not cooked correct? I just made it last night. Had it today. Too lazy to whip up the cream at the end though, haha. But it was good! Tq for this recipe! Glad you enjoyed it even without the whipped cream on top!